Many of our friends have moved over the last few years so I feel I am always looking for thoughtful and easy housewarming gifts. This weekend we went to a friend's new house for dinner. They are "have everything" type people so I picked up a set of adorable summer themed hand towels (I'm really into orange this year) and fancy kitchen hand soap. It's a thoughtful but not over-the-top gift, and it looks really cute in a sweet bag with a little bow. No matter how much great stuff you can have, anyone can appreciate these little gifts. For a weekend hostess gift or birthday gift, you could amp it up with some fun kitchen spoons, fancy dish soap or counter cleaner, and put it all in a nice basket or small colander. For some other former neighbors and very good friends (who had the nerve to move a mile away! ), I struggled for a while with what to get them. Fortunately the struggle ended quickly when I saw this Ron Krajewski print on Etsy. I've seen his work at Eastern Market in DC and always admired it, but I had never seen this Cairn Terrier print. 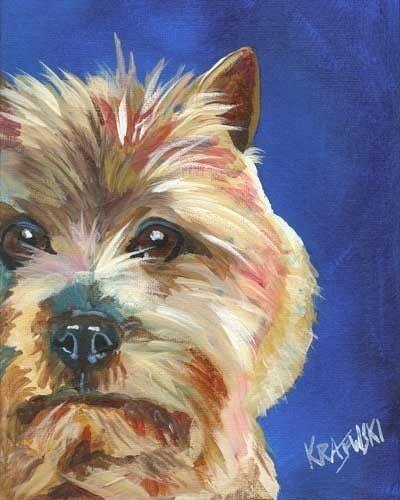 Our friends have an adorable Cairn Terrier, Albus,who looks very much like the dog in the portrait. Of course, I snagged one and framed it in a great wood frame. The finished product was great. They loved it! I love putting together gifts like these because they are thoughtful and useful. What are your favorite housewarming gifts to give and receive?